Britain has reacted strangely to the crisis of neoliberalism. The country’s seemingly endemic nostalgia, particularly for the Second World War, has long been exploited by Thatcherites and Blairites; but its recent political use shows, in an especially acute form, the contradictions produced by an economy of consumption attempting to adapt to thrift, and to normalize surveillance and security in an ironic, depoliticized cultural politics. This can be traced through a single artefact, the Keep Calm and Carry On poster, which has spread all over Britain in the wake of the spectacular demise of the Blair-era boom. From nowhere, this image, which combines bare modernist typography with the consoling iconography of the crown and a similarly reassuring message, has spread everywhere. In the snows that beset London this winter, it became ubiquitous, although the implied message about hardiness in the face of adversity and the Blitz spirit seemed rather absurd in a context where a bit of snow caused the shut-down of London’s entire transport network. This poster seems to exemplify a design phenomenon which has slowly crept up on us in the last few years to the point where it is now unavoidable – a sort of austerity nostalgia, or, more particularly, a nostalgia for the kind of public modernism which, rightly or wrongly, was seen to have characterized the period from the 1930s to the early 1970s, and which has recently been gradually rediscovered and reappropriated. The poster is the most visible form of a vague nostalgia for a benevolent, quasi-modernist English bureaucratic aesthetic. Yet its spread, and its adaptation into a series of police posters, have managed to create a sort of ironic aesthetic authoritarianism, which has a direct correlation with an entirely unironic intensification of repression and police violence. Unlike many forms of nostalgia, the memory invoked by the Keep Calm and Carry On poster is in no way based on lived experience. Most of those who have bought this poster, or worn the various bags, T-shirts and other memorabilia based upon it, were most likely born in the 1970s or 1980s, and have no memory whatsoever of the kind of benevolent statism it purports to exemplify. The poster is an example of the phenomenon given a capsule definition by Douglas Coupland in the early 1990s: ‘Legislated Nostalgia’, that is, ‘to force a body of people to have memories they do not actually possess.’ The poster itself was never actually mass-produced, so even those who can recall the 1940s would be highly unlikely to remember it. It was designed for the Ministry of Information in 1939. The ‘official website’, which sells a variety of Keep Calm and Carry On tat, mentions that it never became an official propaganda poster, so only a handful must have been produced. (The specific purpose of the poster was to ‘stiffen resolve’ in the event of a Nazi invasion. There were two others in the series, ‘Your Courage, Your Cheerfulness, Your Resolution Will Bring Us Victory’ and ‘Freedom is in Peril’.) One of those few was found in among a consignment of secondhand books bought at auction, then reproduced by a provincial bookshop. Initially sold in London by the Victoria & Albert Museum, the poster only gradually became the middlebrow staple it is now when the recession, euphemistically the ‘credit crunch’, hit. Through this poster, the way to display one’s commitment to the new austerity was to buy more consumer goods, albeit with a less garish aesthetic than was customary during the boom. It is in a sense not so different to the ‘keep calm and carry on shopping’ commanded by George W. Bush both after September 11 and when the sub-prime crisis hit America – though the ‘wartime’ use of this rhetoric has escalated during the economic turmoil, especially in the UK. Essentially, the power of ‘Keep Calm and Carry On’ comes from a yearning for an actual or imaginary English patrician attitude of stoicism and muddling through, something which survives only in the popular imaginary, in a country devoted to services and consumption, and given to sudden outpourings of sentiment and grief, as over the deaths of celebrities like Diana Spencer or Jade Goody. The poster isn’t just a case of the return of the repressed, it is rather the return of repression itself, a nostalgia for the state of being repressed – solid, stoic, public-spirited, as opposed to the depoliticized, hysterical and privatized reality of Britain over the last thirty years. At the same time as it evokes a sense of loss over the decline of this idea of Britain and the British, it is both reassuring and flattering, implying a virtuous (if highly self-aware) stoicism in the displayer of the poster or wearer of the T-shirt. 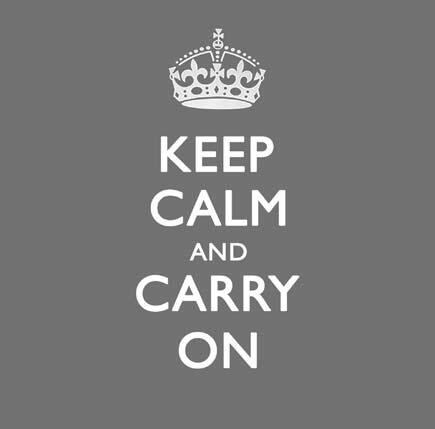 The Keep Calm and Carry On poster is only the tip of a veritable iceberg of austerity nostalgia, and although early examples can be seen as a reaction to the ‘threat of terrorism’ and the allegedly attendant ‘Blitz spirit’, it has become an increasingly prevalent response to the uncertainties of economic collapse. One example is Jamie Oliver’s television programme, book and shop, the Ministry of Food, which, with its 1940s’ typography and its name echoing the wartime Ministry of Information, appeals to a time when things like food or information were apparently dispensed by a benign paternalist bureaucracy, before consumer choice carried all before it; although here the nostalgia is particularly dubious, in that the existence of such a Ministry of Food is all but politically inconceivable, given how it would antagonize such planks of British capital as the supermarkets and the tabloids. Even then, the Ministry of Food appeals to the element in the middle classes that has always enjoyed lecturing the lower orders on their poor choice of nutrition. Then there are the incessant newspaper articles on thrift, usually drawing directly on wartime imagery – such as when a Guardian style columnist offered her make-do-and-mend tips while re-enacting various World War II posters exhorting women to go into the factories. Another, more established example is the use of the 1930s’ Penguin Books cover design as an ‘iconic’ logo for all manner of goods, deliberately calling to mind Penguin’s former role as a substantially educative publisher; or the modifications of their designs into something more eerie and psychedelic practised by the Ghost Box record label. Ghost Box records, such as the Advisory Circle’s Other Channels, explicitly play with the notion of an enlightened, aesthetically advanced bureaucracy, through references to the functionalist musique concrète of the BBC Radiophonic Workshop, the authoritative patrician voices of re-enacted or fictional public service broadcasts, referring to both road-safety films and the apocalyptic horror of the Protect and Survive films designed to be shown in the event of a nuclear war. Ghost Box is a rare example of austerity nostalgia as something genuinely strange and unnerving – the blurring and mess of actual memory, and a persistent hint of the uncanny, prevent them from being merely reassuring. Their aesthetic was described by Mark Fisher as ‘hauntological’ – a sort of return of the social-democratic repressed, as rupture – an aesthetic warped by the intervention of forgetting, vague recollection, and fifty years of history, creating a dream-world of public modernism which never actually existed. Instead of hankering for the past in the context of neoliberalism’s unforgiving bull market, their aesthetic suggests a haunting of the present by the unfulfilled promises of the past. A more typical instance is the company ‘People Will Always Need Plates’, who have made a name for themselves making towels, mugs, plates and badges emblazoned with various British modernist buildings from the 1930s to the 1960s, elegantly redrawn in stark, schematic form, sidestepping the often rather shabby reality of the buildings. However, by re-creating the pure image of the historically untainted building, they manage to precisely reverse the original modernist ethos. If for Adolf Loos ornament was crime, here modernist buildings are made into ornaments. However, the choice of buildings is politically interesting. Blocks of 1930s’ collective housing, 1960s’ council flats, interwar London Underground stations – exactly the sort of architectural programmes now considered obsolete in favour of retail and property speculation. Some of the buildings immortalized in these plates have been the subject of direct transfers of assets from the public sector into the private. An early instance of this was the sell-off of Keeling House, Denys Lasdun’s East London ‘Cluster Block’, to a private developer, who promptly marketed the flats to ‘creatives’; the first in a series of gentrifications of modernist social housing, from the Brunswick Centre in Bloomsbury (turned from a rotting brutalist megastructure into the home of London’s largest branch of Waitrose), to Park Hill, an architecturally extraordinary council estate in Sheffield, given away for free to the developer Urban Splash – although when the boom ended, their privatization scheme was bailed out by millions of pounds in public money. Meanwhile, minimalism has become virtuous. Speculative apartments that became hard to sell in the aftermath of the financial crisis have been sold on their thrifty nature. The Leftbank Apartments, a large, recently completed housing complex in central Manchester, which would almost certainly have marketed itself once as a ‘luxury development’, is now billed as ‘the home of credit crunch chic’, with cheap furnishing tips in the property brochure. New Labour, for all its Americanism and its dizzy ideology of ‘modernization’, has always relied upon the myth of scarcity that characterizes both the British experience of World War II and Thatcher’s invocation of its nebulous ‘spirit’. Even during the boom, ‘hard choices’ were perpetually invoked whenever benefits were to be cut or repression and surveillance to be intensified. Yet some of their politicians appear specifically connected to this trend in political aesthetics, among them the recently disgraced Hazel Blears, who resigned amidst the recent furore over parliamentary expenses. One of the most authoritarian of Labour ministers (launching the ‘five a day’ nutrition campaign as under-secretary of health, defending various repressive measures as minister of state at the Home Office, and echoing the rhetoric of the British National Party as ‘communities’ and local government secretary), Blears is also one of the few prominent New Labour figures from a working-class background. Accordingly, her upbringing itself is mythologized as a subject of austerity nostalgia – she grew up among the deserving poor of Salford, and was featured as one of the child extras in Tony Richardson’s film of that bleakest of kitchen-sink dramas, Shelagh Delaney’s A Taste of Honey. Her somewhat Thatcheresque rhetorical combination of 1950s’ schoolteacher and 2000s’ motivational manager led to a seemingly meteoric rise in New Labour, now halted by a resignation elicited by the thrifty, if not especially austere, matter of huge, and possibly criminal, mortgage fiddling. A Times interview in December 2008 showed that Blears’ public persona was based on a curious combination of homely wartime rhetoric and ruthless Blairite modernization. As such it is grimly intriguing as an exemplar of austerity nostalgia, the only deficiency being a lack of the requisite ironic distance. Much of the interview reads as a document from a country where the Second World War never ended. Not only is Blears’s office decorated with the ‘Keep Calm and Carry On’ poster itself; her rhetoric is pervaded by a strange combination of Victorianism and Blitz spirit platitudes. You can see a frankly impressive performance of Blairite dialectic in her clear desire to play to every constituency at once, mocking bankers on the one hand, but earlier talking about (in a symptomatically progressivist metaphor) how the ‘train’ which they presumably commandeered bafflingly failed to transport every member of society; defending the strict working-class Salford that created her but sticking up for the ending of ‘deference’ and backing off from the possibility that she would ever stand in the way of anyone’s fun; an obvious contempt for the welfare state combined with a belief that the ‘underclasses’ need to be surveilled at all times. But the most interesting phrase used in the interview is that, in the recession, ‘we’ve all got to do our bit’. Blears decries the 1980s as a time when yuppies caroused and others suffered, seemingly unaware that this is by now the public perception of the boom of the last decade (as well as, ironically, of her own behaviour). She represents one of the most unequal places in the country, but one which has been very keen on remaking itself under her watch, via a series of high-profile regeneration strategies. Among them are the transformation of the former Salford Docks into an exclusive entertainment and luxury housing enclave, soon to be occupied by a large section of the BBC, and the selling of terraced houses condemned by the government’s Pathfinder ‘Housing Market Renewal’ scheme (in which a property market was artificially stimulated in former manufacturing towns by the wholesale demolition of working-class housing) to the aforementioned Urban Splash, which turned them into ‘Chimney Pot Park’, a proletarian theme park for Manchester media workers. Yet, when Blears talks of her love of modern buildings, it’s striking how much this fits the nostalgia template: take out the politics and you could imagine her in grainy footage next to an architect’s model in a GPO film. But she certainly wasn’t referring to any new housing for the Salford working class she perpetually invokes. Rather, Blears explicitly distanced herself from council housing in favour of the spectacularly severe solution of ‘mother and baby homes’. Although nostalgia for the watchful eye of benevolent public institutions has led to some direct takeovers of previously public spaces, its most immediately obvious manifestation has been through posters. Perhaps the earliest example was provided by Transport for London, the somewhat beleaguered transport network created by Ken Livingstone as Mayor of London in 2000, which began by trying to reverse privatization and ended by embracing it, in the form of the PFI-funded East London Line extension. A series of posters appeared on bus shelters in 2002, with slogans such as ‘Secure Beneath the Watchful Eyes’ (with said eyes being CCTV cameras). They had distinct similarities in their typography with 1930s’ posters for London Transport by the Bauhaus designer László Moholy-Nagy. They quite deliberately played with the Orwellian associations of 1930s’ and 1940s’ design, the benign eyes watching over London’s bus commuters being explicitly delineated in mock-‘totalitarian’ terms. This is a rather queasy joke. London has some of the heaviest surveillance in the world, and more CCTV cameras than any other city. To treat this as something jollily benevolent is deeply dubious. It advertises the allegedly caring role of the Metropolitan Police in their surveillance of the bus or tube passenger; something which can only leave a foul taste in the mouth after the public execution of Jean Charles de Menezes. The great irony of all this is that the supposedly rather overbearing paternalistic public institutions of the 1940s were either unable or unwilling to set up the apparatus of surveillance that every Londoner now regards as normal. What Orwell did not realize was that the surveillance society would be accompanied by ironic jokes, not shrill exhortations. In April 2009, another series of posters appeared on British streets, this time under the auspices of the police. Based ostentatiously on ‘Keep Calm’, they share the same centred design, the same humanist sans serifs, but replacing the crown with the police badge. The written content consists of three slogans, all based on particular clichés used by the police in the popular imagination, albeit in one case with a decidedly sinister twist: ‘We’d Like to Give You a Good Talking To’, ‘Anything You Say May Be Taken Down and Used as Evidence’, and, remarkably, ‘You Have the Right Not to Remain Silent’. Underneath, in an extremely small, easily missed print, is the ‘official’ message, based on ‘the Policing Pledge’, one of the many managerial initiatives intended to ‘restore confidence’ or ‘enable choice’ in one or another public body. For instance, the ‘talking to’ poster’s pledge is to listen to the consumer of policing, while ‘not to remain silent’ suggests you make complaints against the police should they inconvenience you. In their split between an authoritarian exclamation and a liberal, caring small print which, supposedly, gives an amusing gloss to the large print, these are spectacular examples of disavowal and the use of irony to say appalling things unchallenged. The sleight of hand is thus: the pun, the pay-off, is in small print, reminding us that really the police force are all about helping old ladies across the road, ‘the police now pledge to listen…’, the truth is in large print. Given the recent suspension of habeas corpus, one genuinely does not have the right to remain silent. So while this ‘witty’ gesture claims to play with the brutally state-protecting image of the police, it also says, very loudly, that the rules no longer apply, as would be made obvious at the G20 protests on 1 April. The true obscenity of these police posters was made apparent in an advertisement produced by the Ministry of Justice, which ran in local papers in spring 2009 – the version I have is pulled from the South London Mercury on 1 April. Again the centring, the vaguely Gillesque typography; again, the large message and small print; again, the replacement of the crown, this time by the coat of arms of the Ministry of Justice. The background this time isn’t the original red, the police posters’ blue, but a Guantánamo orange. The slogan, ‘Have Your Say on How Criminals Pay Back’. The observer of recent advances in the world of punishment will recognize the reference to the Community Payback scheme, an intensification of community service, where petty criminals are made to work in ostentatiously bright outfits, in gangs, as a display of their debt to the public. ‘Justice Seen Justice Done’, as another Ministry of Justice slogan at the foot of the poster has it. The advertisement explains: ‘Community Payback is a punishment that can be handed out by the courts. It is physical work, carried out by criminals in the community. Offenders have to wear bright orange jackets marked Community Payback, so you’ll see them paying back for their crimes. Members of the public can have their say on where offenders are working and the kind of work they are doing’. To witness an instance of Community Payback, as I recently did in a Greenwich council estate, is an alarming experience – a score of downcast black youth, being led by a similarly orangejacketed overseer, to pick up rubbish in an area where the council infrequently collect. the tabloid-courting methods of punishment, inching as close as possible to public humiliation while stopping short of outright violence. The combination of the focusgroup/Guardian Society supplement sound of ‘community’ and the macho ‘payback’ is especially telling. Note, too, that this is all about ‘choice’ and ‘empowerment’, in that the community is asked specifically to choose the punishment for the petty criminal. The ad offers few clues as to what this might entail, but the message is more important than the actual possibility that the victim of a burglary might ask orange-jacketed teenagers to weed their front gardens. Meanwhile, the dividing line between authoritarianism as design in-joke and as actual political practice has been definitively crossed. Yet what made these posters and advertisements especially remarkable was that they coincided with one of the first instances of public protest after the financial crisis – the G20 protests on 1 April, in the City of London. In the months leading up to them, the police had promised violence, even to the extent of issuing a statement of unusual aggression, declaring themselves to be ‘up for it’. Meanwhile, new anti-terrorism laws made photographing policemen potentially illegal, if it could be proven that they were in the midst of an approximately anti-terrorist activity, or if the photographs could be useful for terrorists themselves. Within minutes of entering the space between the Bank of England and the Royal Exchange, it was obvious that the police – who had already made a return to aggressive policing, absent on the heavily attended Stop the War demonstrations of 2003–05, at the Gaza protests the previous winter – were intent on a riot, irrespective of whatever the protesters wanted. The ‘kettle’ in which the G20 protesters were enclosed became the site, later recorded on digital cameras and mobile phones, of women being hit for talking back, of climate camp protesters with their hands in the air being baton-charged, of police medics wielding truncheons, and most famously, of the manslaughter (at least) of a passer-by, Ian Tomlinson. In the aftermath of the police riot and the blizzard of false information on Tomlinson’s death, an anonymous Internet user produced a variant on the ‘Keep Calm’ poster, sadly photoshopped into a bus-stop billboard rather than replacing one of the actual posters: ‘Lash Out and Cover Up’. In the face of the consolatory aesthetics of austerity nostalgia and the use of a legislated memory of World War II as the public face of police brutality, an act of détournement seemed decidedly appropriate.